Believe it or not, Alec Bradley has not always been known for modern, heavy-hitting, flavor-bomb smoking experiences. The company, founded by Alan Rubin (and named for his two sons, Alec and Bradley), debuted at the tail end of the great cigar boom of the '90s, offering mild smoking experiences geared towards golfers. This approach took a drastic turn when Alec Bradley introduced the now-legendary Tempus cigar in 2007—the brand's first full-bodied offering. Alec Bradley Tempus (now known as Alec Bradley Tempus Natural) receives its unique smoking profile from a rare wrapper leaf, which is sourced from the Trojés region of Honduras. It's this leaf that the entire blend was build around. In fact, the company waited years for enough of the dark Criollo leaf to be ready for production, eventually pairing the tobacco with a double binder (Honduras, Indonesia) and hearty fillers of Honduras and Nicaragua. It's these filler leaves that give the Tempus its intense smoking profile, which is balanced to perfection by the unique profile of the Trojés wrapper. 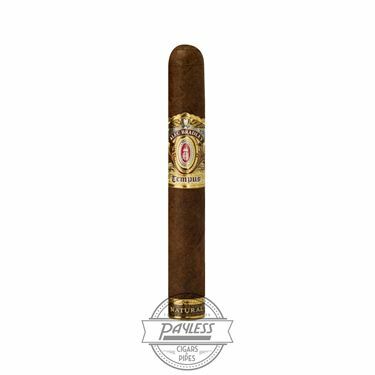 Since the release of Alec Bradley Tempus Natural, the cigars have been placed on Cigar Aficionado's Top 25 Cigars of the Year list on two separate occasions (ranked at #25 in 2008 and #5 in 2017). The blend has also been rated as high as 94 points by the publication, a feat most cigars never reach.